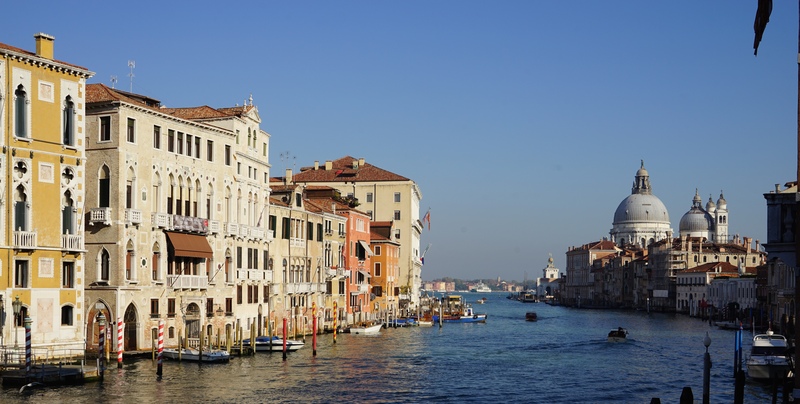 We set off early to start the next leg of the journey, it was somewhat of a logistical challenge to get from Milan to our little apartment in Venice, incorporating crossing most of Northern Italy, an airport, a boat and a horse. Google maps had our drive at three and a half hours but it had been wrong before so we decided to be conservative and leave ourselves plenty of time. Fortunately this time (possibly for the first time on the trip) our drive time was better than the maps prediction, so with time to burn we decided to pull off the motorway and do a one hour smash and grab tour of Verona. I don’t mind saying it, amazing decision by us, on parking the car and turning the first corner we were greeted by the view of the old cities giant stone gates, almost immediately through the gates we came upon a giant piazza which wrapped around a Roman Age arena. 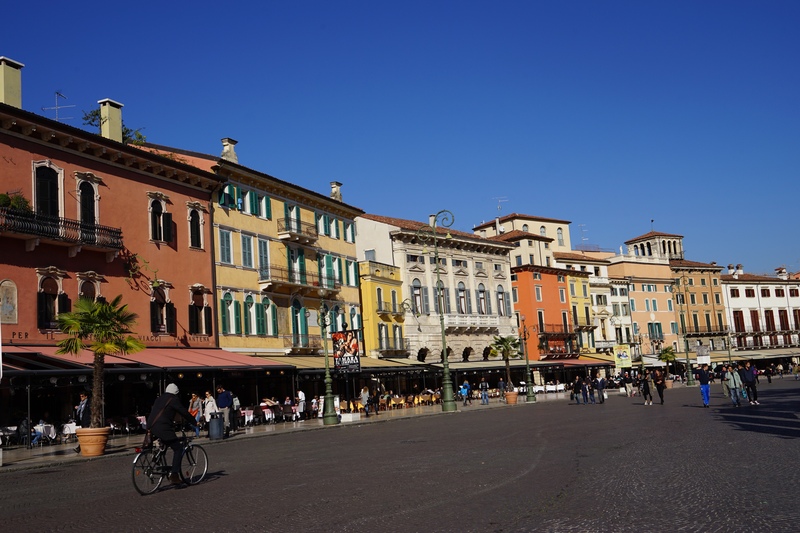 Our first impression of Verona was that they have done an amazing job of protecting the old city, whilst it has been modernised and continues to be a working city, it has retained so much of it’s character and atmosphere. It has been unlike anywhere else we have visited on the trip so far, we almost didn’t visit here at all due to some negative advise we picked up along the way, we are disappointed we didn’t stay for days and glad we got in for an hour or so to check it out. 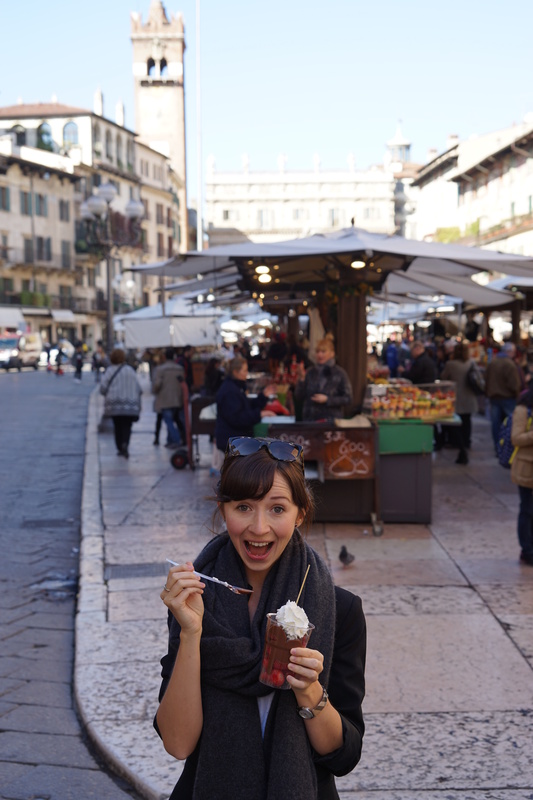 If you are touring Italy I think you should definitely put it on your itinerary! 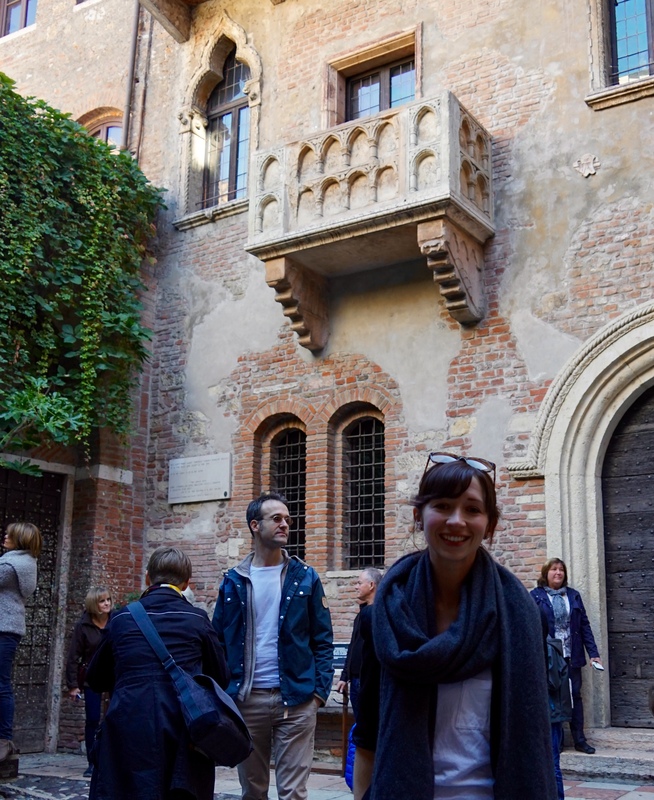 With limited time on the clock I gave Jess the choice of any attraction in Verona to check out, she chose Juliette’s balcony so we began weaving through the cobbled streets hoping that our tenuous grasp of Italian had us bearing in the right direction. We successfully arrived at the balcony, following the throng of tourists with selfie sticks for the final few hundred metres. 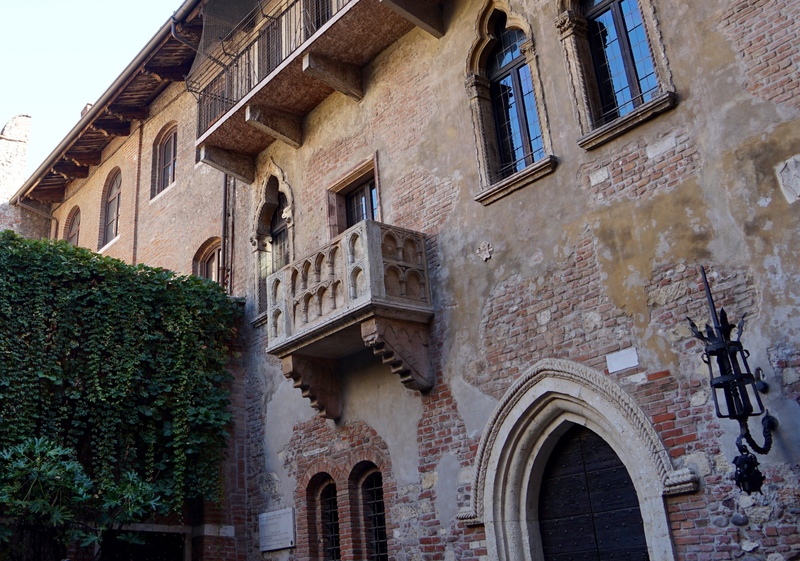 The story goes that the characters from Romeo and Juliet were based on two lovers from Verona who died in 1303 and that the Capulets are based on the Dal Capello’s, a prominent family who have owned the house and lived in Verona since the twelfth century. Not in a position to comment on the legitimacy of these claims, I can however say with certainty that it was a very nice balcony. 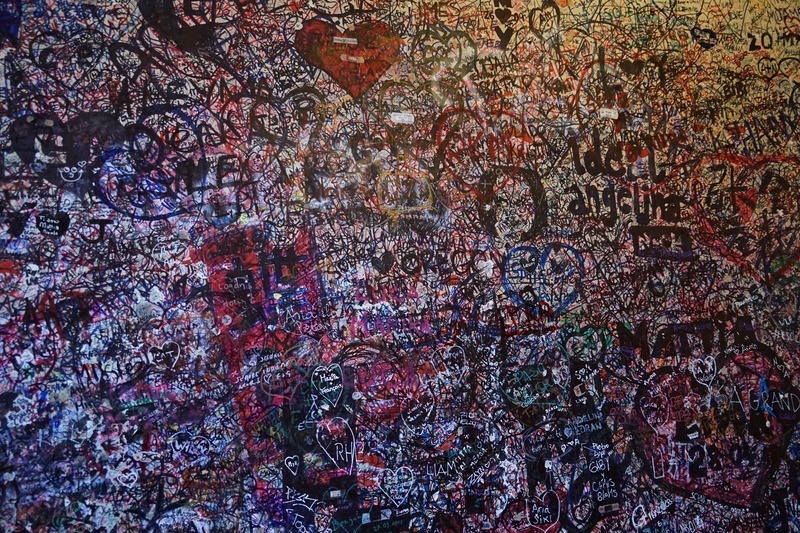 Jess was clearly impressed with it, as were the hundreds of thousands of people who flock their annually and write love notes in the entrance tunnel to the courtyard. With Jess’s hunger for romance sated we decided to focus on our appetite for Italian cuisine and grab some lunch before we continued our journey. Jess had her head turned by a cup of strawberries with liquid chocolate and cream and was incredibly excited by the outcome as you can see below. Walking around the streets there were many options but I asked myself WWBWD (What would Ben Wyatt do?) 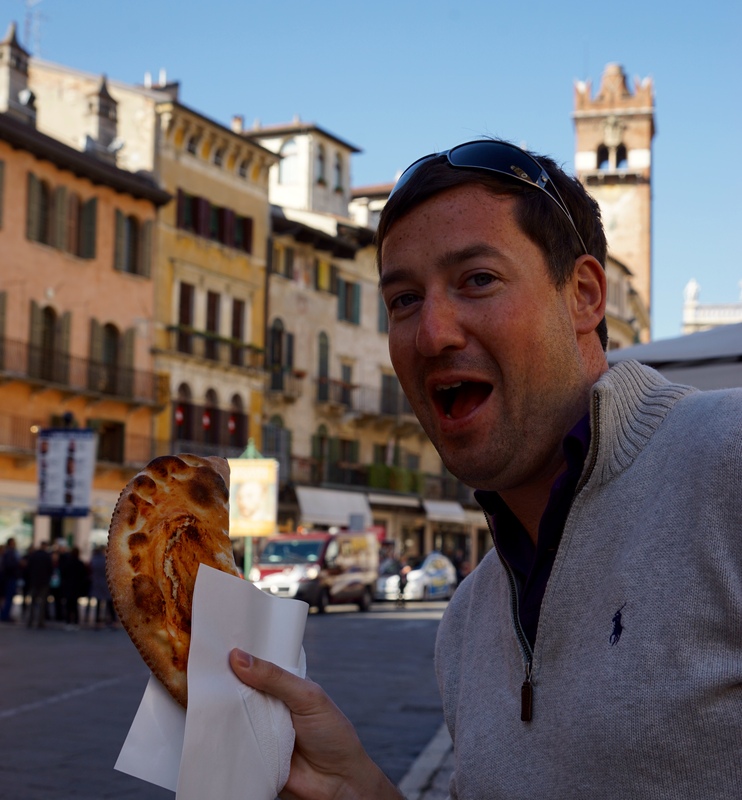 and knew what I wanted, I wanted a calzone. It was delicious. 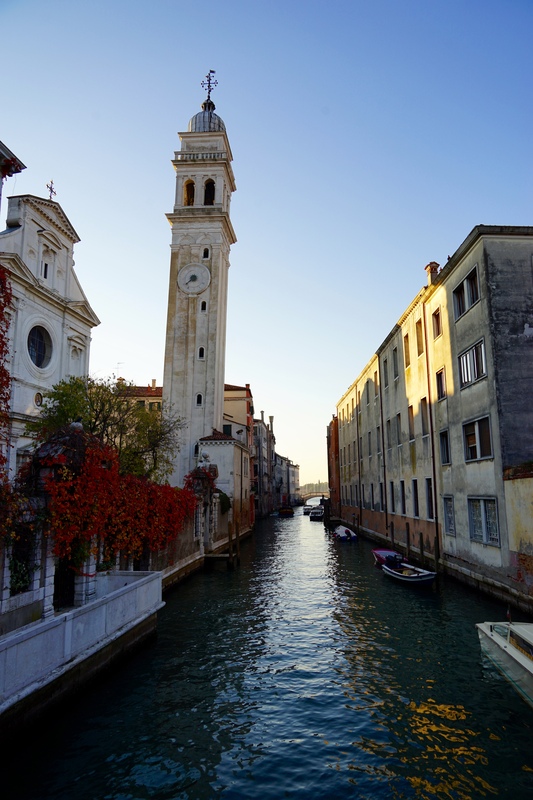 After a quick walk around the city centre our time was up and we were back on the road to Venice! 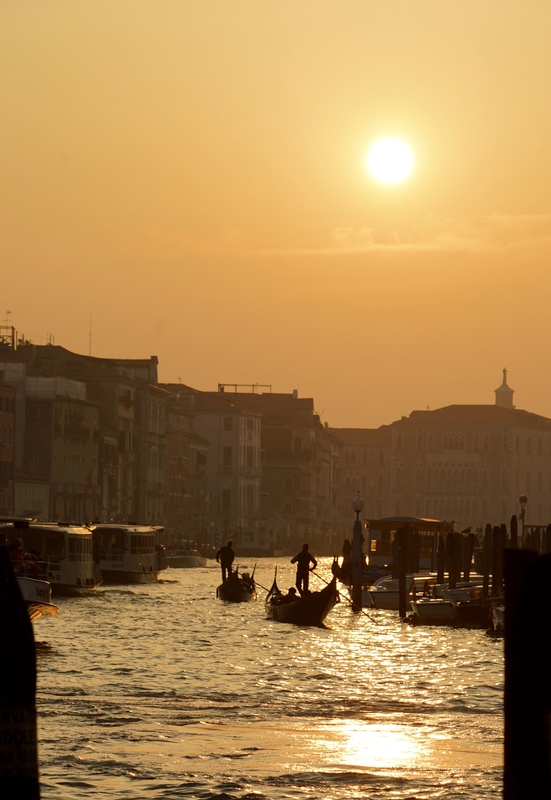 Our arrival in Venice proper couldn’t be achieved until we got rid of our car so our first port of call was the Marco Polo Airport where we could leave the car in safe parking for three nights at a cheaper rate than what it could cost for one day in Venice. There is a bridge that would have allowed us to drive out and leave the car but it seemed like too much hassle and I was happy to be free off driving as quickly as possible. 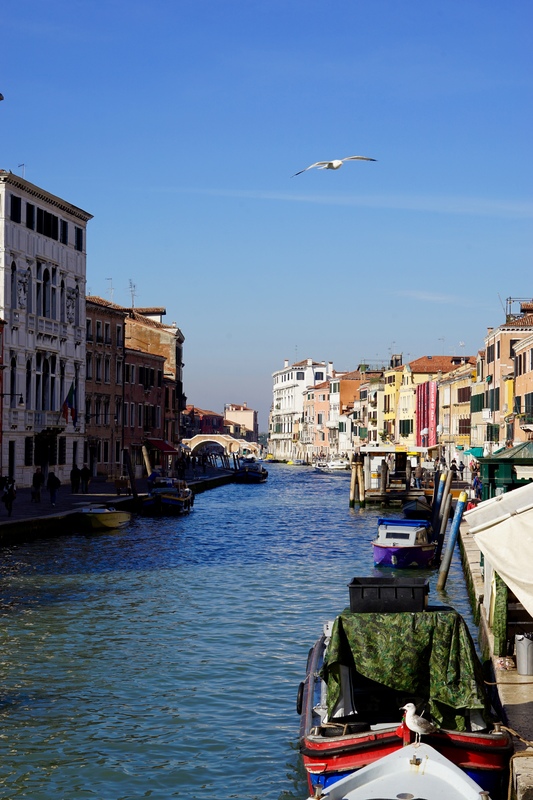 From the airport we caught the Alilagula water taxi in to Venice via Murano Island and walked down to the square where we were meeting our AirBnB host who would show us to our apartment. 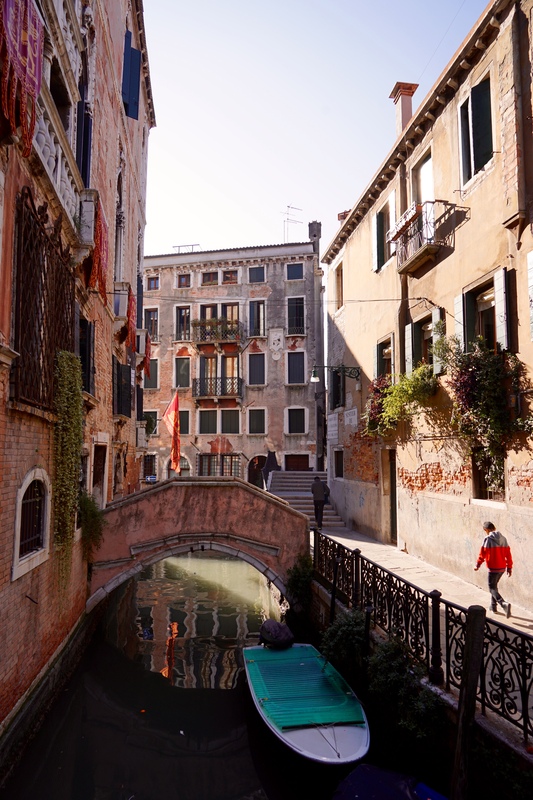 We were incredibly happy when we only had to walk for a couple of minutes from the square and even more-so when we discovered that we had a balcony set over the canal with the superb view you can see in the first picture below. We didn’t have any big plans for our first night in Venice so decided to go for a wander and “get lost in Venice” as everyone recommends during. 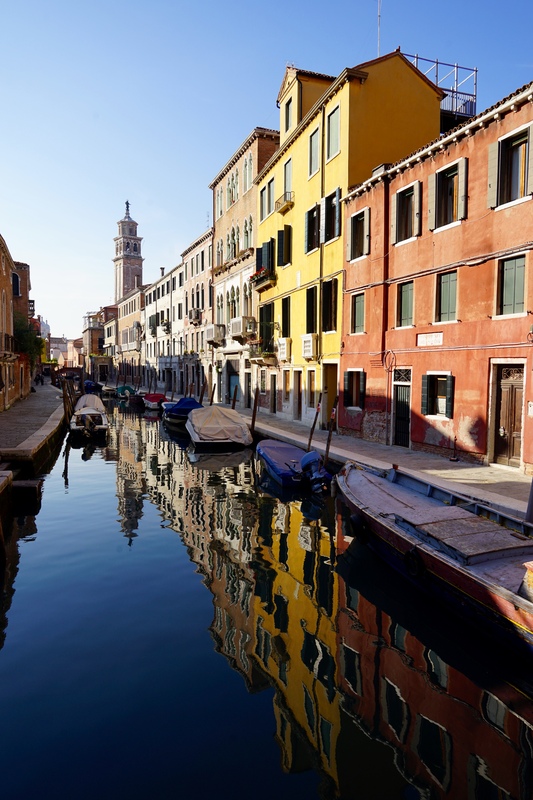 It happens quickly, the streets are short narrow and criss cross all over the place and their are hundreds of islands and bridges so you become disoriented almost immediately. 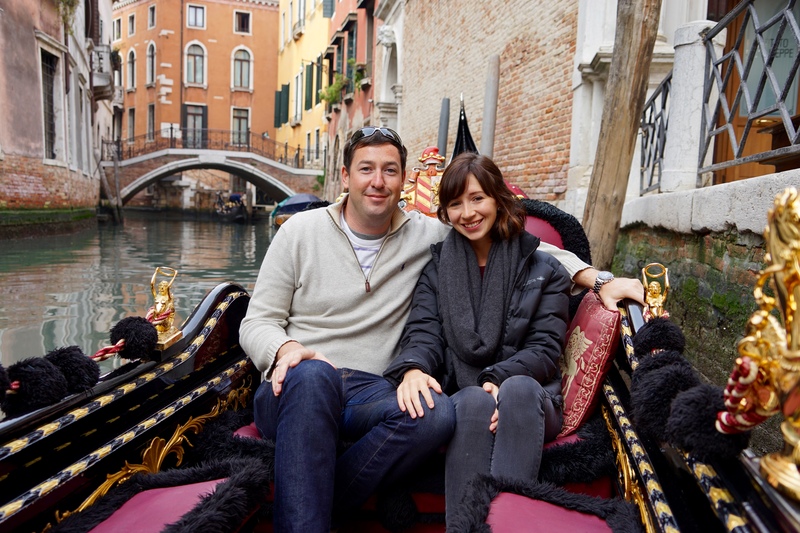 This for us was the most fun in Venice, just heading in a general direction, seeing what we found and knowing we’d probably never find it again if we tried. We made it as far as St Mark’s Square where we took in the sunset before grabbing dinner and then a bottle of red wine to enjoy whilst planning our adventures in the city for the next few days. 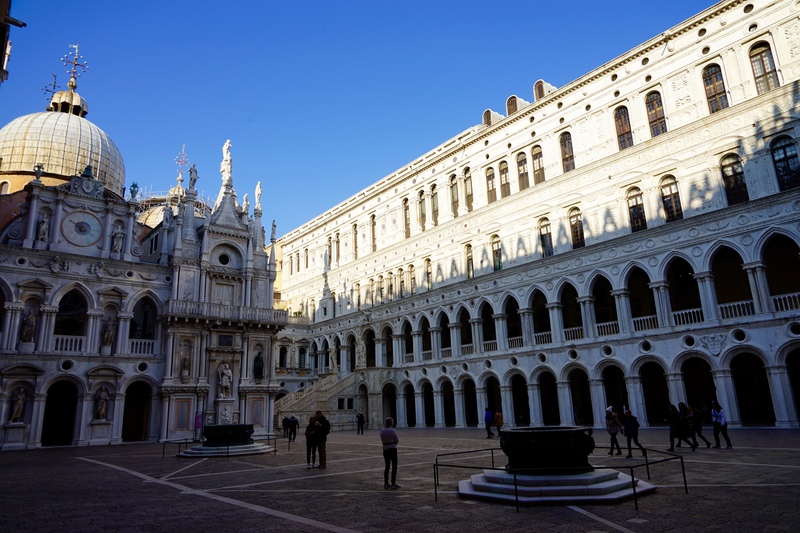 The next morning we were up early so we could beat the day-trippers and the cruise ship passengers into St Mark’s Square and all of the other popular tourist spots around the Castello and San Marco neighbourhoods. 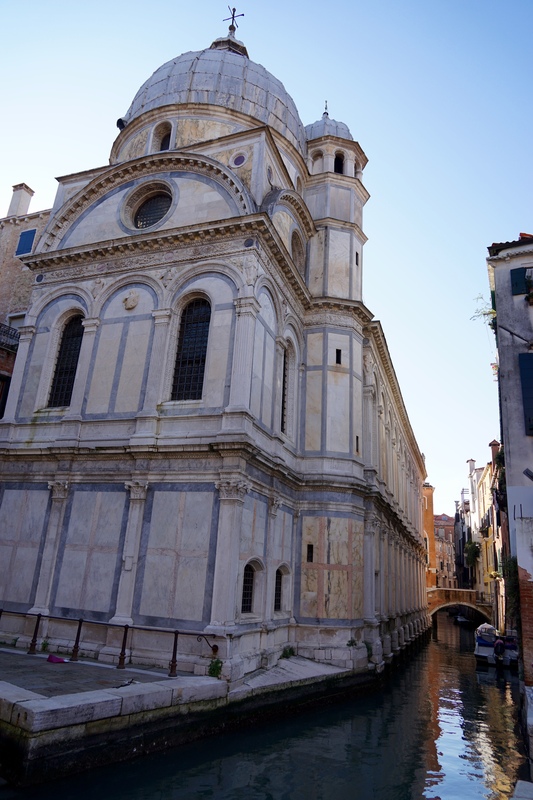 Once the masses of visitors rolled in at around ten we decided to head out to the Cannaregio district which was much quieter and visit the Jewish Ghetto. Pretty much everywhere you go in Venice looks amazing and is really interesting if you just sit and watch the world go by for a few minutes. 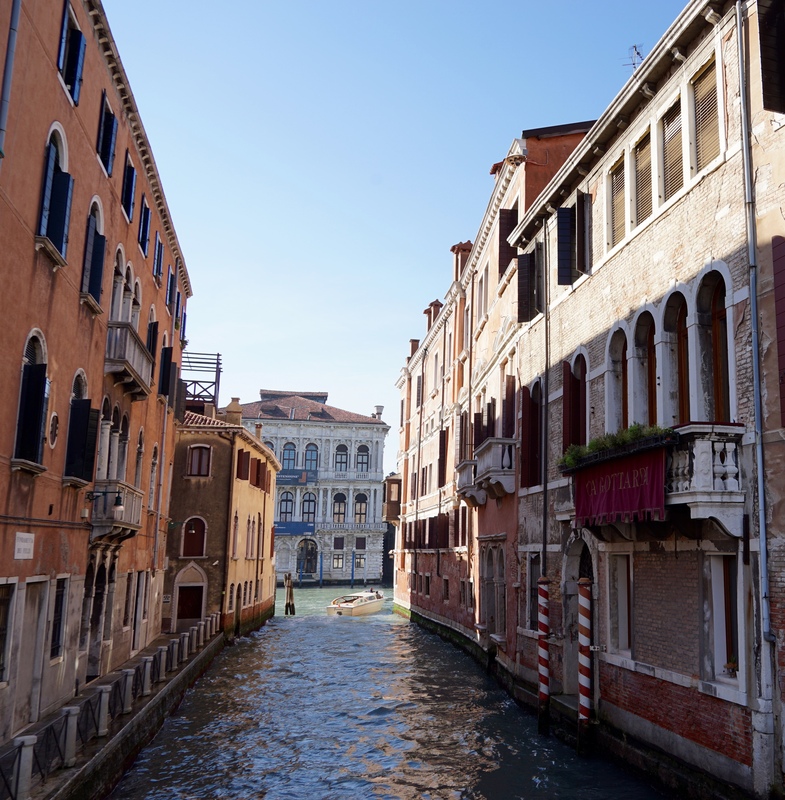 We found a couple of canals that were not so frequently visited by the gondolas and water taxis and were instead filled with fisherman and delivery drivers going about their business. It was nice to get out of the tourist congestion for a while and getting a taste of how the locals live. 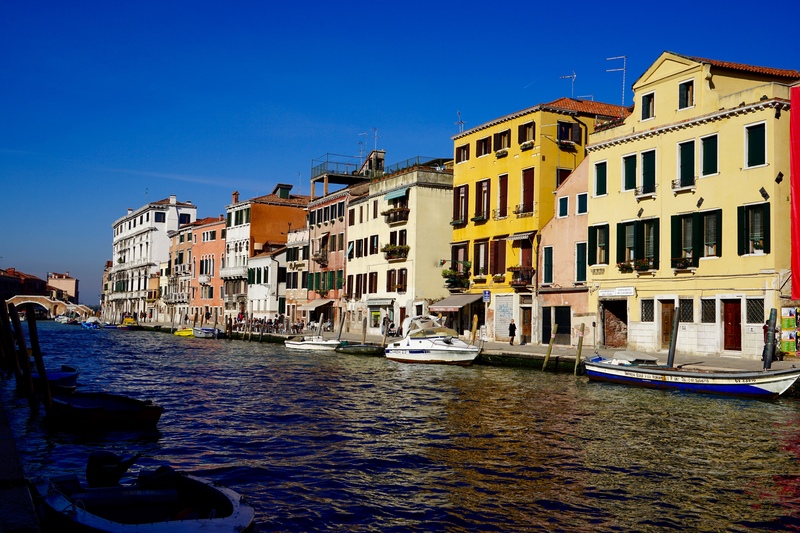 Speaking of taste… There are a plethora of restaurants in Venice, some great and some average, during the day however I would advise you not to bother with restaurants at all. 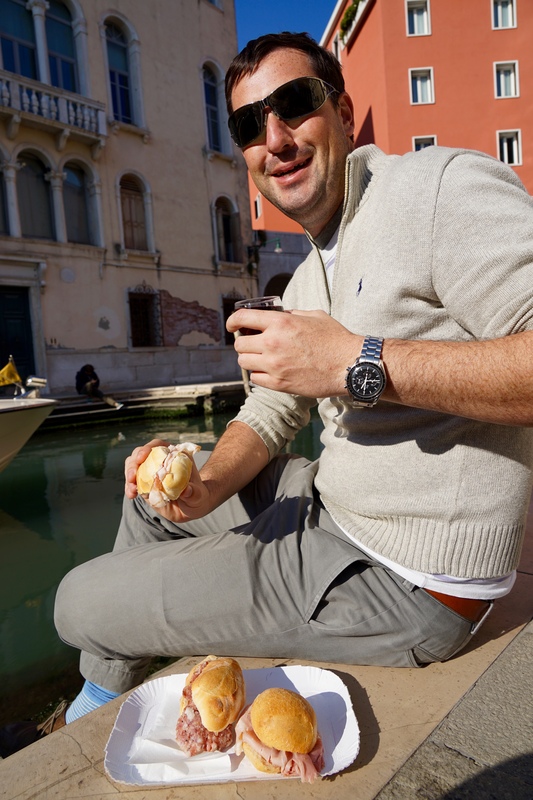 The best thing to do in Venice is to snack on Cicchetti all day as you wander around and wash them down with a few glasses of wine. Cicchetti are a Venetian specialty and can be quite broadly defined depending on who you ask, some people say all appetisers and small snacks fall into this category, others say that they must be bread and meat based snacks… We stayed out of that debate and just enjoyed whatever was in front of us. Most often you will also be able to order a ombra (tiny glass) or two of wine to accompany your snack at a very cheap price, which was great thing as the house wines were all excellent. We stumbled across a place called Bacareto Da Lele by accident and got three amazing rolls stuffed with gourmet meats and cheeses, an ombra of red wine and a bottle of water for 4 Euros and enjoyed it whilst sitting by the canal. 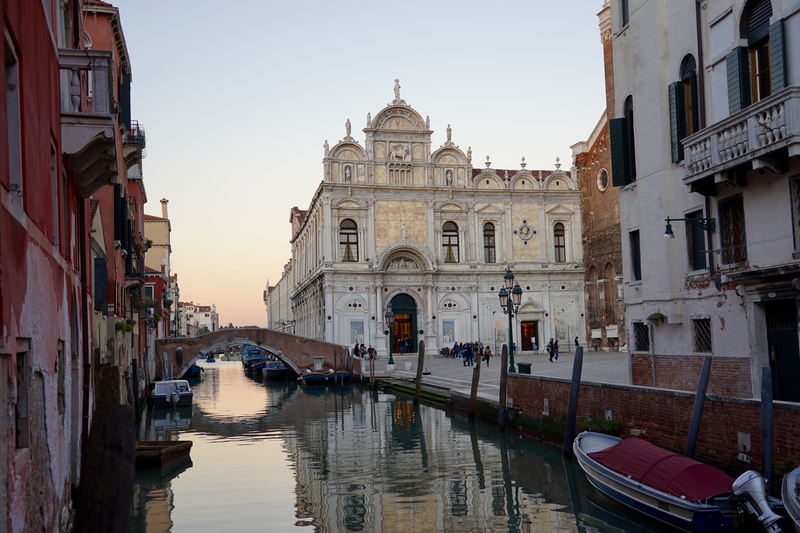 We later found out that Da Lele is a Venetian institution loved by tourists and locals alike which explains why it was so crowded when we visited! Amazing food, amazing price and amazing location. Do try it! After a morning off the beaten track we decided that we had better do some more of the expected sites otherwise we would run out of time so we tried to head back to the main square. 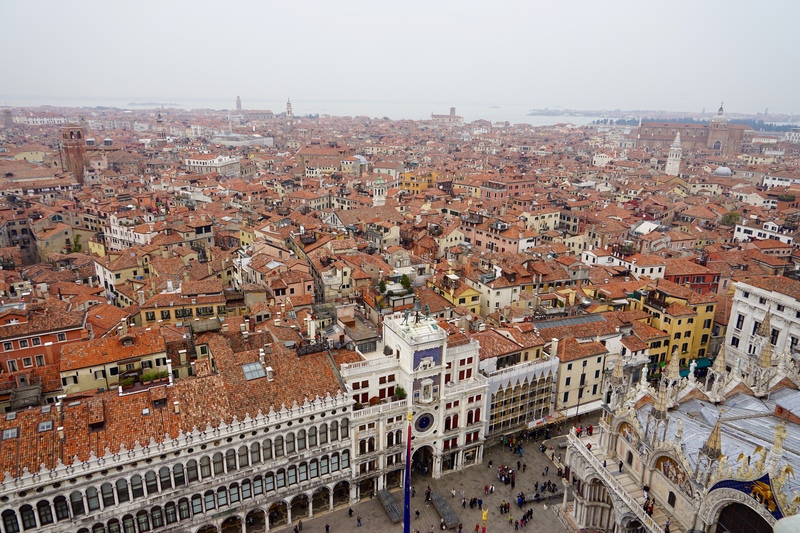 Unfortunately with Venice being Venice we got extremely lost and ended up almost circumnavigating the island to get back to St Mark’s Square. 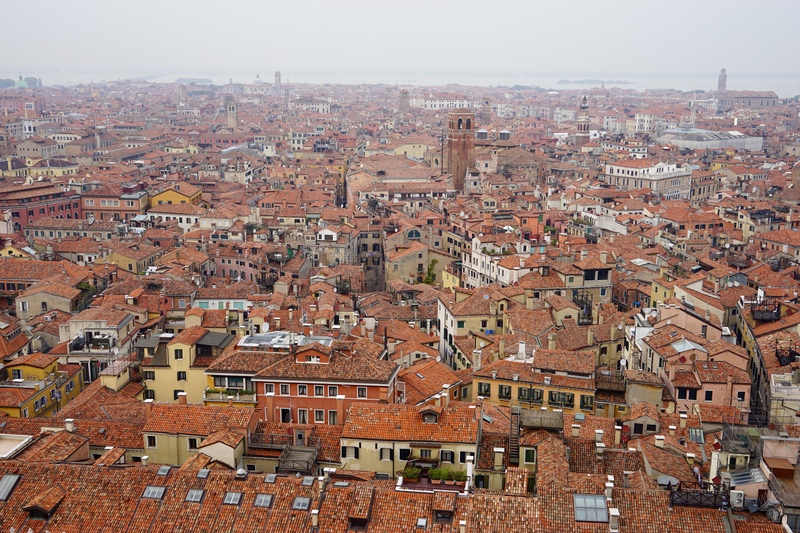 The upside of this was that we got to check out the city from several new perspectives and also saw an older Italian gent do some extreme double paddle gondoliering to cross the open water from Murano to the city. On our triumphant return to the square we headed straight to the Doge’s Palace which serves as a museum for the province of Venice whilst in itself standing as a monument to the wealth and power of the Venetian empire in it’s prime, it is a colossal structure and the most richly and ornately decorated building I have ever seen. 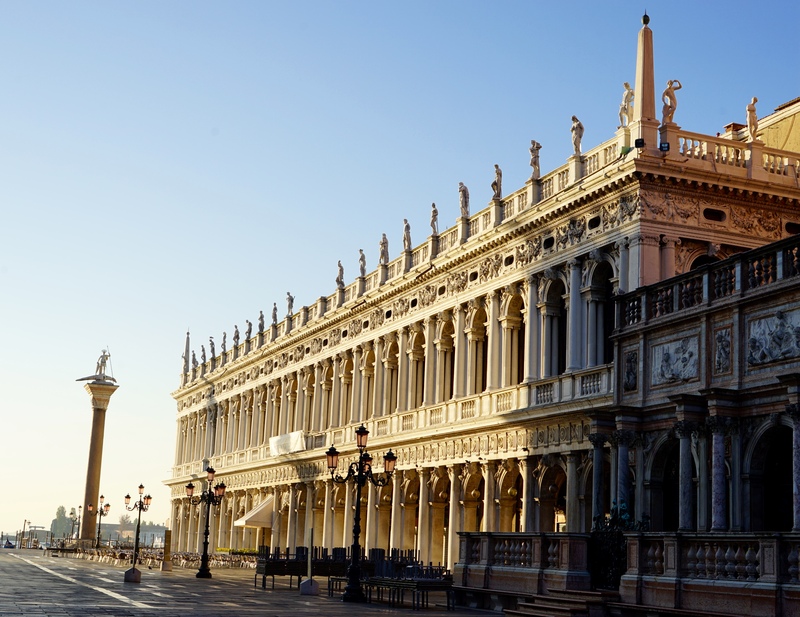 The Doge was the ruler of the Venetian empire and he oversaw an incredible governance system including a variety of councils and senates that managed the realm. 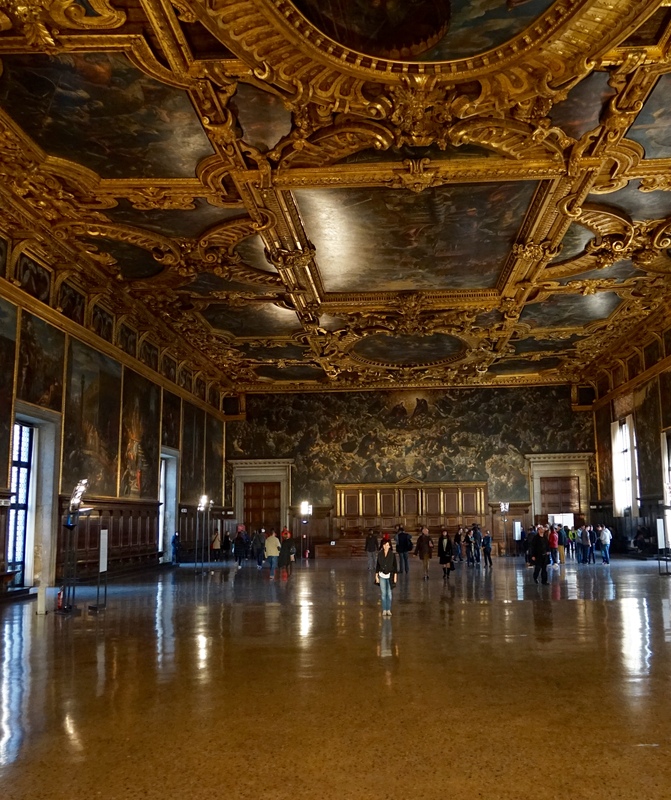 They were all housed in the palace, alongside the Doge’s personal residence, wings to house and entertain visiting dignitaries, the courtroom and the prison. 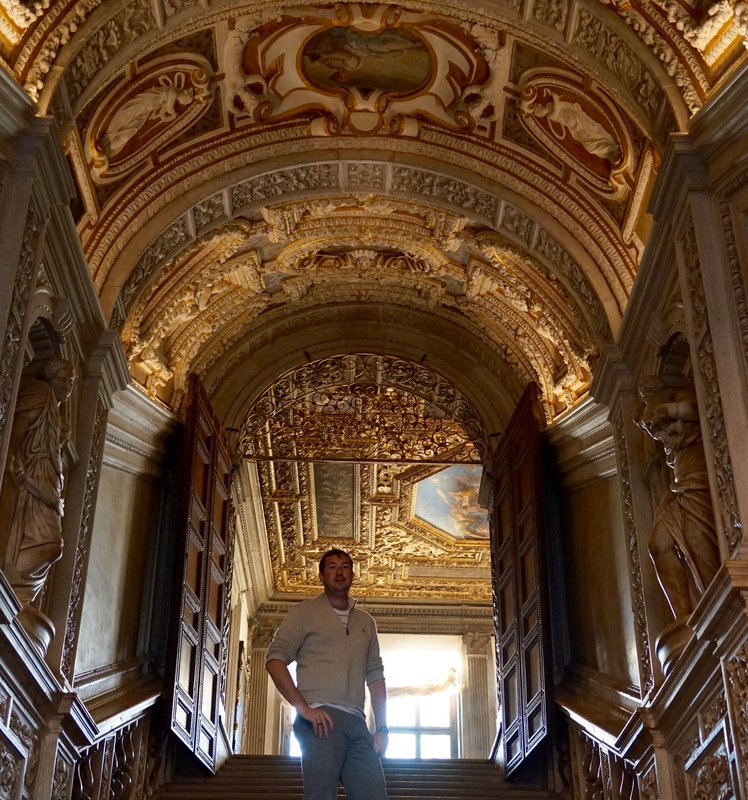 They definitely have a thing for gold, once you are inside you can venture up the golden staircase and work your way through the various staterooms, they are all decorated floor to ceiling in murals or just gold. 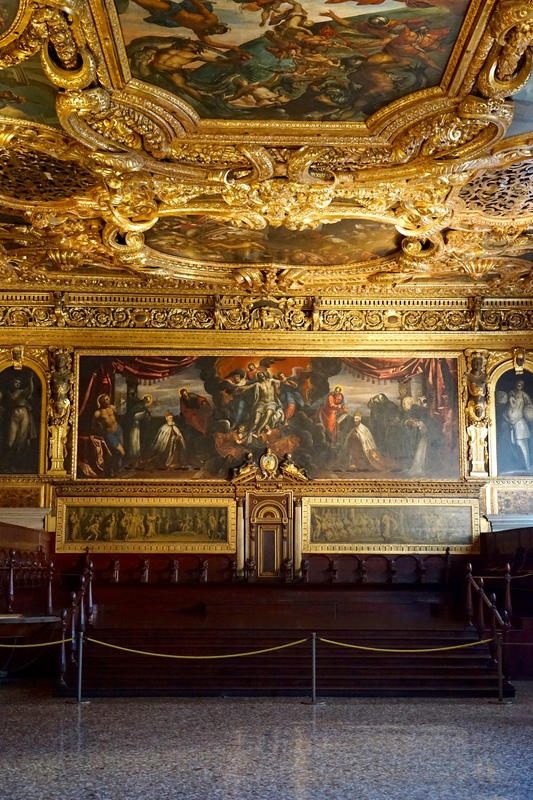 Each individual council or senate had it’s own chamber, each more lavish than the last until we arrived in the Grand Hall which you can see in the third picture below. Even when you enlarge the image it is hard to see Jess standing in the middle of the room, it is enormous, and every inch of it is decorated with religious murals to battle scenes. Very impressive stuff. 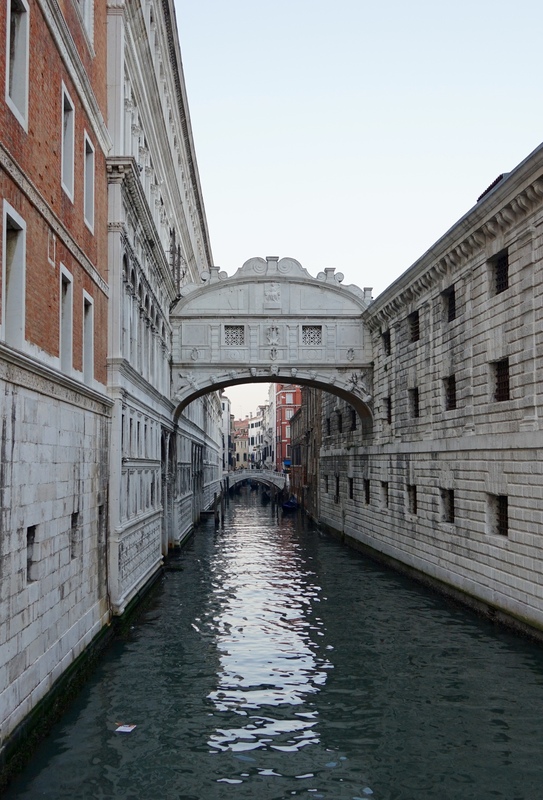 After the royal apartments and Grand Hall we crossed the “Bridge of Sighs” and entered the prisons. 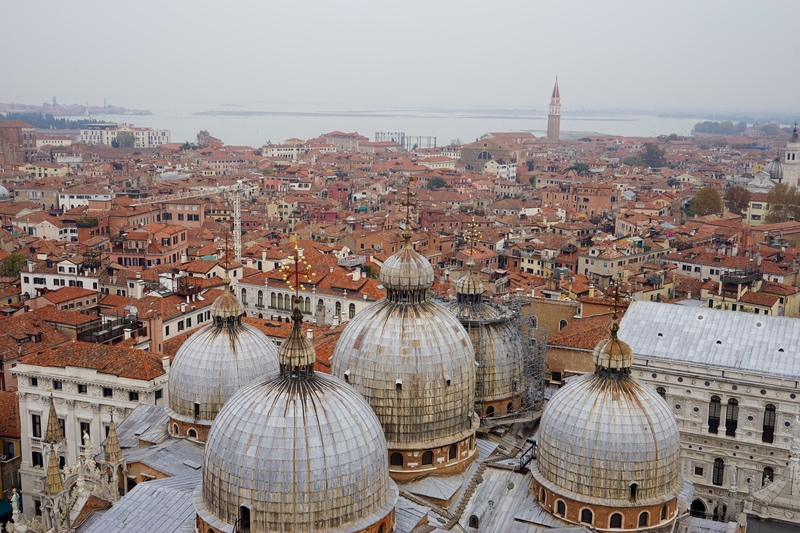 The bridge was apparently named this during Venice’s romantic period by some flamboyant wordsmith who surmised that each prisoner would sigh at the beauty of the vista from the tiny windows on the bridge as they gazed on Venice for the last time. We doubt a single prisoner ever did such a thing but the name stuck and many a selfie stick wielding tourist can be found in front of it. 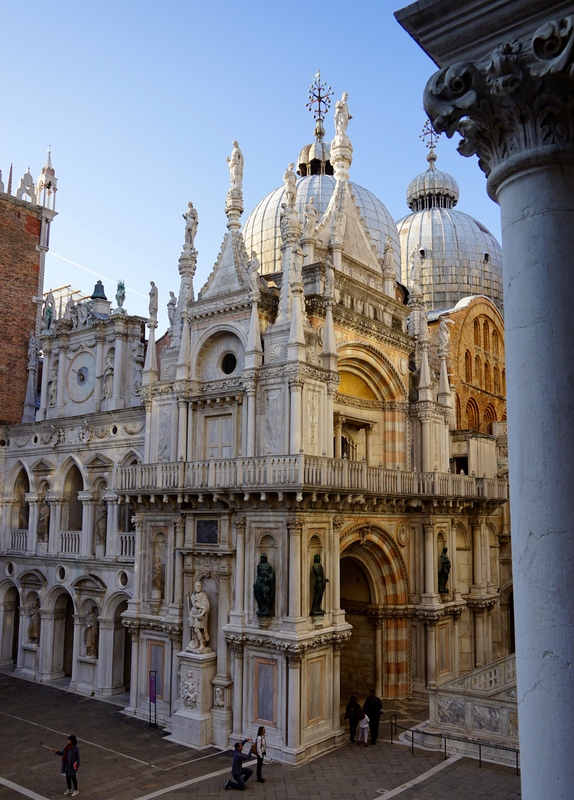 The prison itself was intense, tiny cells, lots of bars and some famous torture methods employed at the behest of the mysterious Council of Ten who despite all of the councils and the senate were the real power in Venice under the Doge and specialised in making people and problems disappear. 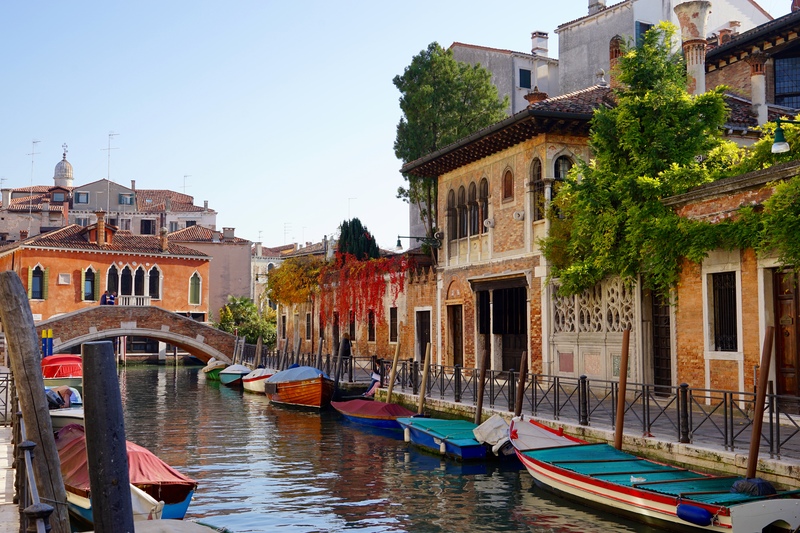 Throughout our stay we had gone back and forth on whether to take a Gondola ride or not, we had read some reviews that said it was the highlight of peoples trips and others that said it was a waste of time. 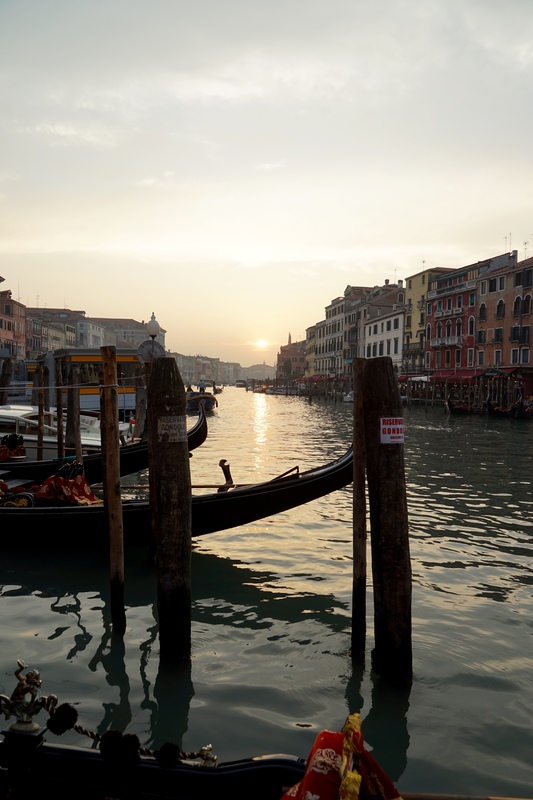 In the end we decided to start the next day by doing it, it is one of the most iconic experiences you can have in Italy so figured it would have been remiss of us not to give it a go. First things first, it is not cheap, a half hour ride during the day will normally set you back 80Eu with the price rising to 100EU in the evening, the prices are regulated by the city so you have very little bargaining power. We were fortunate that we were visiting in an off peak period and found a great guy who gave us a slightly extended trip and knocked 20EU off the price for us. 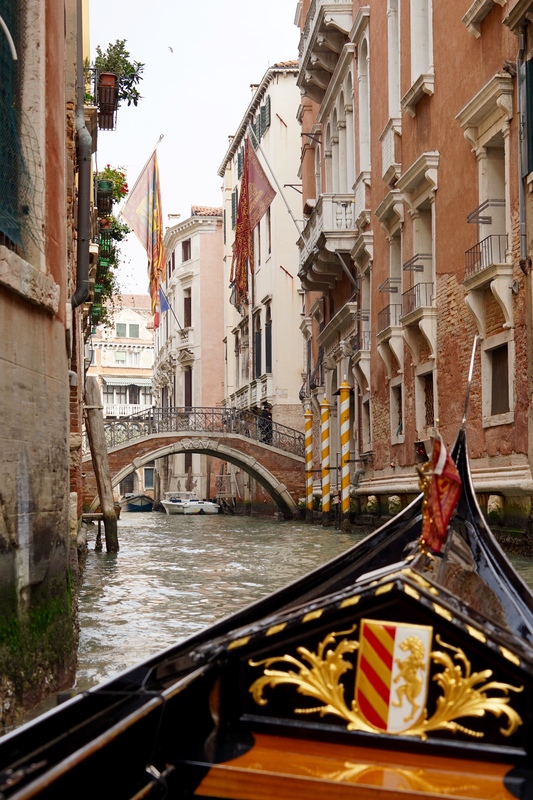 We chose to go around some of the minor canals and stay out of traffic which is something that I would recommend, we got a great tour of some of the embassies, classic hotels, villas and even the famous Casanova’s former Venetian residence – our gondolier even through in a song for us. 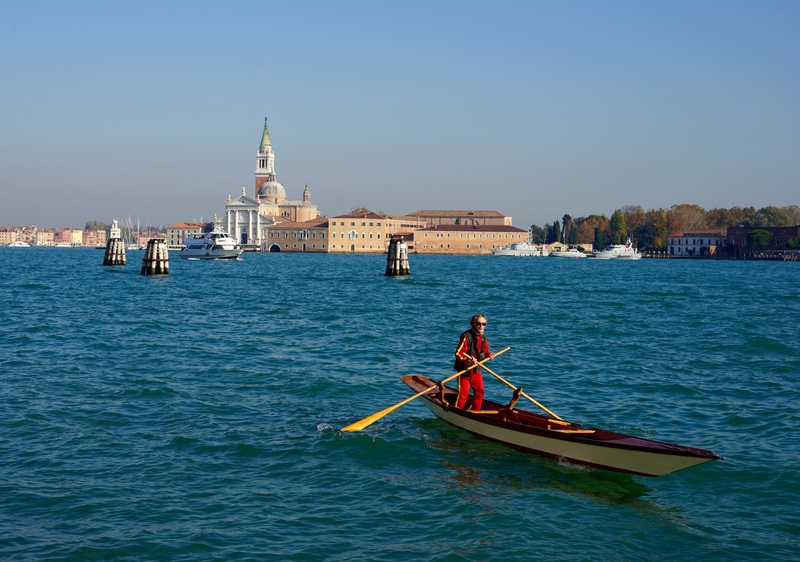 It may not be for everyone but we enjoyed it and definitely thought it worthwhile, my tip would be to find a gondolier that you like and have a chat to them beforehand, that way you’ll get a tour and some banter while you were on the water. 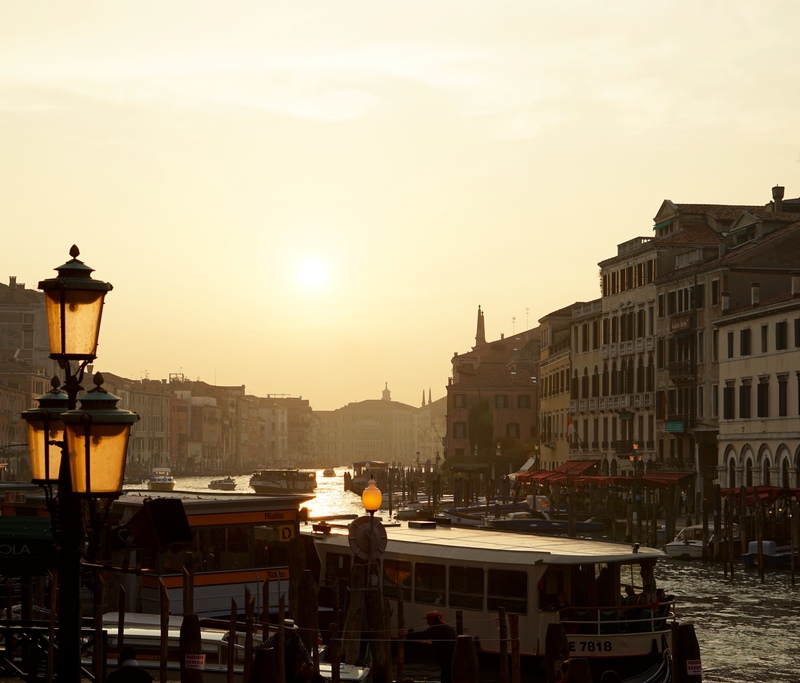 We finished our time in Venice by setting up next to the famous Rialto Bridge and taking in another Italian sunset. 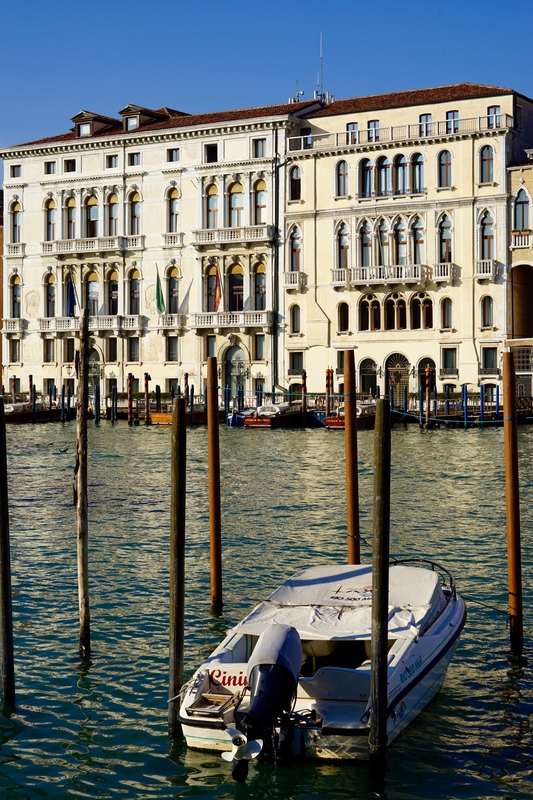 It is a great place to sit and take in Venice as it is such a hub for the city, it is one of only two major crossings of the Grand Canal as well as being one of the busiest sections of water in the city. 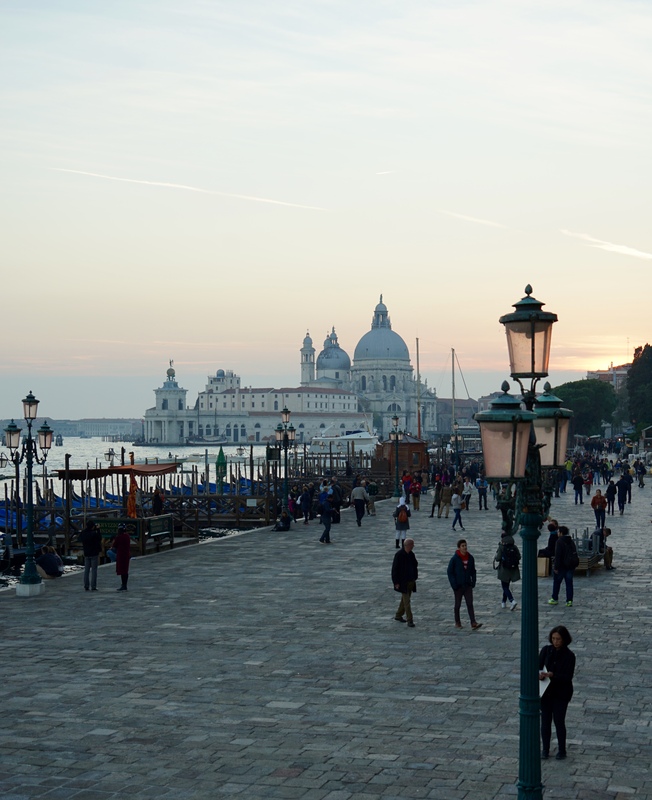 It is a hub for tourists and locals alike and we enjoyed sitting and taking it all in while we said goodbye to Venice. 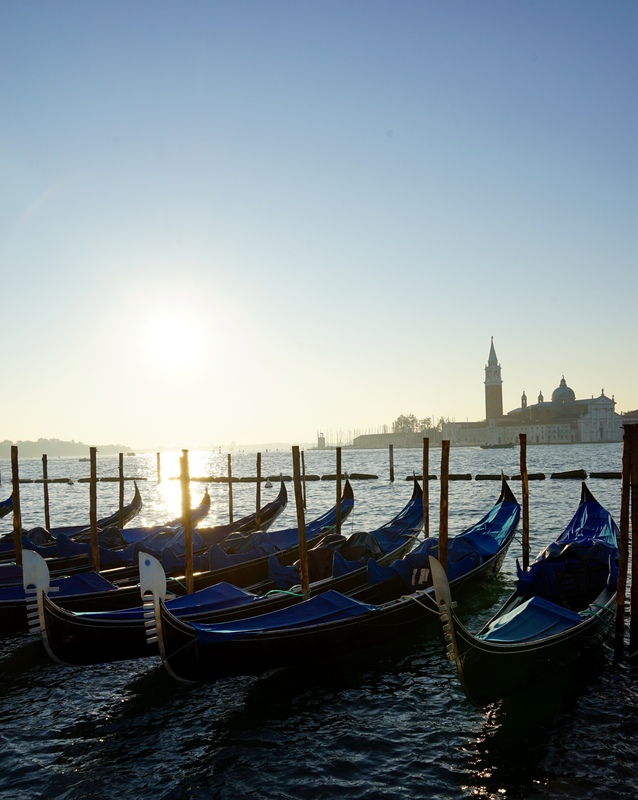 That’s it from our Venetian adventures, our next stop is Florence and a tour of Tuscany.